Food manufacturing is a continuous, fast-paced production environment where quality and product safety are paramount. In our latest case study, we outline how we greatly reduced the cost and turnaround time for one multi-national snack food manufacturer. With chutes, rollers, hoppers, knives and countless other machinery all playing an integral role in the manufacturing process, there’s a lot of equipment involved in the production of the average food product. To ensure safe, efficient, high quality production of food it is essential to use the optimum coating system. From new pre-installed equipment, to used equipment that’s needing maintenance as part of a scheduled plan, our teams at Surface Technology have a rich depth of experience in working with food manufacturers and the equipment manufacturers who supply them. In the case study, we look into the work Surface Technology completed to maintain a multi-national snack foods manufacturer’s machinery. 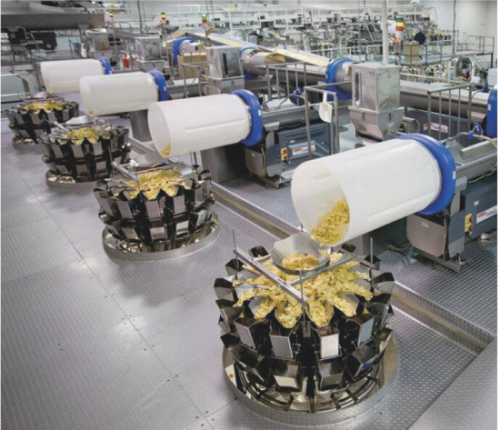 With no specification to go on, our technical team were tasked with identifying the optimum coating for the snack foods manufacturer’s serrated rollers – machinery which applied the ridges to their popular crinkle cut crisps product. A solution that was FDA approved as food safe, offering excellent surface wear protection from the abrasive product, and high non-stick properties for the sticky potato was essential. Identifying a highly effective double reinforced system with high release and wear characteristics, we re-coated the rollers back to offer the same performance as new rollers. Not only did the surface coating greatly improve the performance of the rollers, the service also led to a 75% reduction in maintenance cost and 90% reduction in turnaround time for the manufacturer.